Commercial vehicles pose unique dangers to ordinary drivers. Because of their weight and limited maneuverability, tractor trailers can easily cause serious accidents. An experienced Nashville Truck Accident Attorney at Matt Hardin Law understands the complexity of litigating truck crash cases. We can help you seek compensation if you have been injured in a truck accident. What Truck Accident Types Does Matt Hardin Law Handle? Our legal team knows that proving fault or negligence after truck accidents can be a highly complex and difficult process, as no two truck accidents are alike. Because of the complexity of these cases, we are constantly researching and learning more about all major types of truck accidents to further level the playing field between our attorneys and the insurance companies. Having a law firm on your side that knows the ins-and-outs of all aspects of the trucking industry, from the state rules and regulations that govern it to the most common types of accidents that occur in Tennessee, can be a tremendous boost when you’re seeking compensation for your accident-related expenses. Per guidelines enforced by the Federal Motor Carrier Safety Administration, truck drivers in the United States are required to adhere to strict rest, break, and sleep schedules. If they violate those guidelines, they can not only put themselves and others at serious risk of accidents, they can also be held responsible for any injuries or property damage that their negligence causes. Trucks have large blind spots that make it difficult or even impossible for drivers to see other vehicles. However, blind spots can be reduced by adjusting mirrors and sitting in the truck cabin at the proper height and orientation to maximize the view of the road. When truck drivers fail to use their mirrors or their seated position to get a clear view of the roadway both in front of and behind their vehicles, they can strike other cars and SUVs and cause serious accidents. The most important safety features on tractor-trailers and semi-trucks are their brakes. Because trucks can weigh up to 80,000 pounds, having capable braking systems that can slow down or stop these large vehicles over a short distance is essential—especially when they are driving in heavy traffic or near passenger vehicles. Trucking companies and truck owners are responsible for making sure their trucks have well-maintained and functioning brakes at all times. In addition to federal regulations, the state of Tennessee also has strict regulations that govern the trucking industry in order to promote safety. Some of these regulations include things like maximum truck size and weight, required licensure for all drivers, and medical clearance from doctors for drivers to be allowed to get behind the wheel or large trucks. Our attorneys work hard to make sure all trucking companies play fair and abide by these rules if their truck drivers are involved in accidents. Truck drivers frequently have to make wide turns in order to maneuver in tight intersections or streets. In many cases, they may be forced to swing out into adjacent lanes of traffic in order to safely complete those turns. However, some truck drivers fail to exercise proper care and caution when performing these turns and strike nearby vehicles, causing drivers and passengers to suffer serious injuries. Semi-trucks and tractor-trailers are several times larger than passenger vehicles like cars and SUVs, but oversized trucks are even more massive. Because of their huge size and weight, oversized trucks must be driven with extreme caution and drivers must receive extensive training. If the trucking company or driver fails to observe and follow the required safety steps for operating these massive vehicles, serious accidents can occur. Although they are common sights in Middle Tennessee—especially near construction zones and industrial parks—dump trucks pose a significant risk to the drivers and passengers of cars and SUVs. In addition to outweighing standard vehicles by tens of thousands of pounds, dump trucks also frequently carry large loads that must be firmly secured at all times. If a dump truck is involved in an accident or loses its cargo on a roadway, multiple parties may share responsibility for the crash. Due to the massive weight of semi-trucks and tractor-trailers, the tires on these vehicles bear large loads. That makes it vital that truck drivers, companies, and owners keep them well-maintained and properly inflated at all times. When trucks have blowouts due to tire wear, improper tire pressure, and overloaded trailers, drivers can lose control and strike other vehicles, causing serious injuries and significant property damage. Delivery trucks are a common sight in Nashville and other cities in Middle Tennessee. Whether they’re hauling business equipment, soft drinks, food products, or other items, these trucks are often much larger than passenger vehicles—and that means they can pose significant risks when they’re involved in accidents. Drivers and company owners are required to act with caution when it comes to loading and unloading these trucks, making deliveries on time without speeding, and maintaining a strict maintenance and repair schedule. When a truck loses a wheel, the results can be catastrophic for both the driver and people in vehicles near the truck when the incident occurs. Trucks can suddenly lose wheels for a variety of reasons, including over- or under-tightened studs and bolts, using the wrong size or type of studs and bolts to secure the wheel, or failing to maintain and repair wheels that are damaged or old and in need of replacement. A bustling logging industry in Tennessee means that logging trucks can be found on the highways, interstates, and rural roads in the mid-state area. But like all big trucks, logging trucks represent major risks for both their drivers and other motorists when they’re involved in accidents. Whether the accident was caused by negligent driving behaviors, violations of trucking industry regulations or failure to properly secure logs and other cargo, our Nashville truck accident attorneys can investigate and help victims like you get compensation. Sanitation workers are essential to modern life in both residential and business areas of Middle Tennessee, but the trucks they use to do their jobs outweigh passenger vehicles by tens of thousands of pounds—and that can make them dangerous during accidents. In addition to drivers having poor visibility and long stopping distances, garbage trucks also pose risks to other motorists when their cargo isn’t properly loaded and secured. Loose debris from garbage trucks can damage vehicles and cause injuries—especially when drivers swerve to avoid it. Like dump trucks, cement mixer trucks are common sights near construction zones and industrial parks. These oversized vehicles are essential to maintaining the bustling economy and infrastructure throughout Davidson County and its surrounding areas, but they also require frequent maintenance, strict safety protocols, and stringent licensing for drivers. After accidents involving cement mixer trucks, our legal team investigates to find out if any of those requirements were violated and played a role in causing victims’ injuries. In addition to their extreme weight and size, tanker trucks may also pose risk to other drivers due to the cargo they carry. Whether it is gasoline, toxic and corrosive chemicals, or other flammable liquids, tanker trucks that are involved in even minor accidents can cause serious injuries and health complications for anyone involved in collisions with these large industrial vehicles. Because of the significant dangers that tanker trucks can pose to motorists, they are heavily regulated and both drivers and businesses must exercise extreme caution and care when using these vehicles for commerce. Like all large trucks, flatbeds are frequently used to carry heavy cargo, including disabled vehicles, industrial supplies and equipment, and other objects that can weight thousands of pounds. But unlike other types of trucks, flatbeds don’t have physical barriers separating the cargo from the roadway. That means a single loose cable or strap can cause the cargo to come loose and slide off into the roadway, putting the lives and safety of nearby drivers and their passengers at risk. In 2012, there were 3,409 truck accidents in Tennessee that caused an injury or death. This is a 400- to 500-accident increase over each of the previous three years, according to the Federal Motor Carrier Safety Administration (FMCSA), which is the federal agency charged with regulating commercial traffic. The FMCSA promulgates the rules and regulations that govern truck drivers and trucking companies. 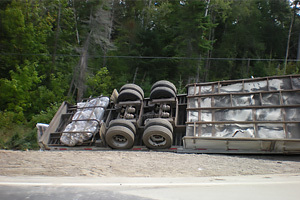 Failure to comply with these laws can expose truckers and their employers to liability in the event of a truck accident. People injured in an accident with a tractor-trailer or other commercial vehicle can file a lawsuit to seek compensation for their injuries. Most such lawsuits allege negligence on the part of the truck driver or the trucking company. Plaintiffs must prove three distinct elements to prevail in this kind of lawsuit after a truck accident, and our Nashville lawyers can help. First, the plaintiff must prove he was owed a duty by the defendant. Truck drivers and trucking companies, who are usually the defendants in a truck accident case, have a duty to behave reasonably given the circumstances. This is a universal duty owed to everyone on the road. Second, the plaintiff needs to show that the defendant breached the duty of reasonable care. Defendants can breach this duty in countless ways. Truck drivers must abide by strict hour limits, and they cannot drive when they are unreasonably fatigued. Truckers must drive reasonably by checking their blind spots and avoiding unreasonably wide turns. Trucking companies must maintain their trucks in good working order. They cannot overload their trucks, which can adversely affect braking ability. Failure by a truck driver or trucking company to do any of these things is considered a breach of their respective duties. Finally, the defendant’s actions that constituted a breach must have caused the plaintiff’s injuries. Most of the time, this is proven when the defendant’s actions caused the truck accident. In such cases, there is almost always causation. It is important for truck accident victims to contact a knowledgeable Nashville attorney as soon as practicable after the accident. Attorneys must preserve crucial evidence necessary to litigate these cases. Driver logs, cargo information, and maintenance records might all contain valuable evidence, and too often these records are deleted or lost if they are not requested immediately after an accident. Truck accident plaintiffs who win their lawsuit are entitled to damages from the defendant. The defendant must reimburse the plaintiff for the objective costs of the accident: medical bills, lost wages, and property damage. In addition, defendants are liable for the more subjective injuries the plaintiff sustained, such as mental anguish and pain and suffering. Protect Your Rights, Call a skilled Nashville Truck Accident Attorney at Matt Hardin Now! People injured by a negligent truck driver or trucking company have a legal right to compensation for their injuries. If you have been injured in a truck crash, hiring a knowledgeable and experienced Nashville truck accident lawyer is the best way to protect your rights under Tennessee law. The attorneys at Matt Hardin Law have significant experience litigating Tennessee truck accident cases. To schedule a free consultation, call (615) 200-1111 or visit our contact page.